Current NaNoWriMo soundtrack (for when I'm actually writing instead of pretending to): "A Charlie Brown Christmas" soundtrack and "Holiday Inn" soundtrack. Oh, dear. I am such a terrible manager of my time. You would have thought that College Success Skills class would have cured me of that. But no. Today is supposed to be my big catch-up day with writing my novel, reading, writing in my journal, doing a little sewing, and possibly even decorating my bare aluminum Christmas tree that stands in the corner. But no. I have been distracted all morning, mostly by the Internet. It's just so tempting, when I'm writing my story. That little Internet Explorer button is right there, and it's so easy to click it, just to check Blogger or search for the meaning of a name, I tell myself. An hour later, I somehow find myself drooling over journals on Etsy. How did that happen? It's a mystery. Seriously, though, the creativity of other people amazes me, inspires me, and makes me feel like a loser (sometimes all at once). Bookbinding? How awesome would that be? There are so many beautiful journals on Etsy that it makes me want to sit down and fill mine up with a lot of nonsense, just so I have to order another one. 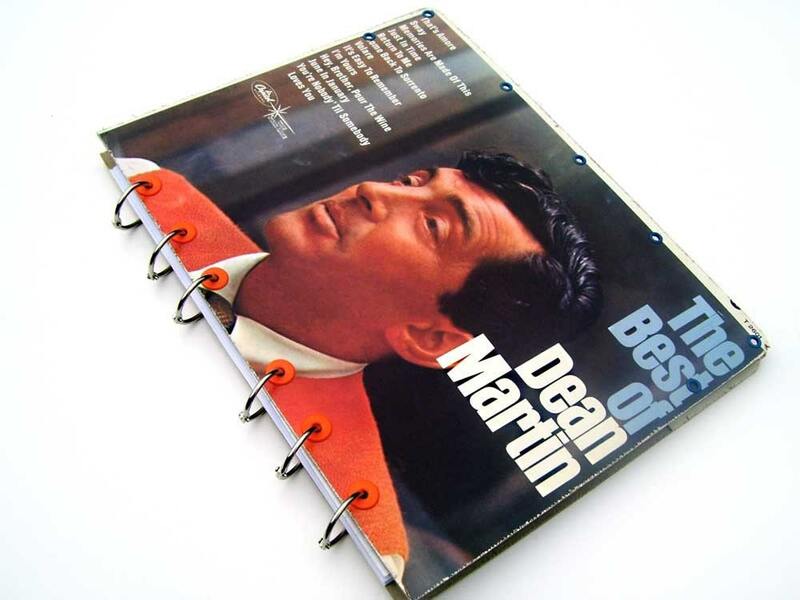 There are lovely handbound vintage style journals, and most of them aren't that expensive. The first thing I bought with some of my graduation money this summer was a new journal: a leather one with sheet music on it, handmade in Italy (it came from the Barnes and Noble website). It is beautiful, and it smells wonderful, but it cost $35, and I've recently discovered that I could have gotten a one-of-a-kind handmade on on Etsy for less than that. Look at this one. How awesome is that? 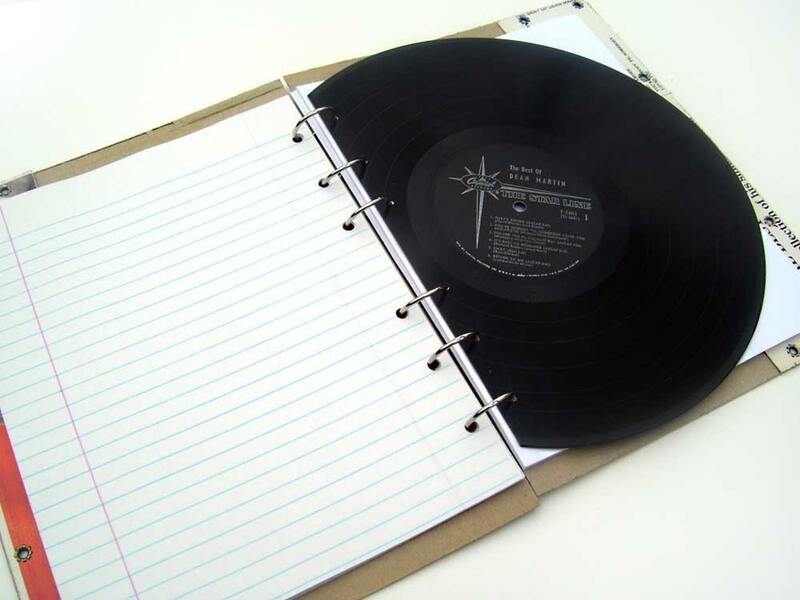 A journal made out of an album cover...with a record for a divider...and clips so that you can add or remove pages. That is one of the coolest things I've ever seen. Counting shipping, it would still be less than $30. And you can add pages, so basically you could use it until it fell apart. I can see now that I'm going to get nothing accomplished today. Except those 400 words I wrote in my story this morning. I'm so thankful that my class was canceled this morning. Our community college had a lockdown. Someone saw three guys, one with a gun and another with a baseball bat. I'm still not exactly sure what happened, but the police were called. Nobody at the school was hurt, and the lockdown has been lifted. I'm so glad that I wasn't there...it would have been really scary. And I would have been arriving there just after the lockdown was enforced, so it would have been chaotic, I'm sure. I couldn't have gotten to class anyway and probably would have had to just drive back home. "Dancing with the Stars" was awesome this week. Probably one of the best weeks ever. On Monday night, the dances were awesome, especially the Latin round where they had to dance with a theme of a certain decade: 60's through the future. Derek and Joanna's futuristic dance was one of the weirdest dances I've ever seen, but it was amazing. And I just love Mya and Dmitri. And Michael Buble sang my two favorite songs of his on there last night: "Haven't Met You Yet" and "Feelin' Good." It was so lovely. Switchfoot's new CD "Hello Hurricane" came out yesterday, and JesusFreakHideout's reviews are really good for it. I'm such a dummy...I was in the Christian bookstore (both of them in our town) yesterday, but only looked at the books. I didn't even go into the CD section, because I thought that CD wasn't being released until the end of November. So now I have to stop by there tomorrow after class and pick it up. The sample clips sound very interesting! Why is writing a story so much harder than writing in a blog? I'm off...to try and do something productive with my day.